Residence Hall Fabrics – Leading the Institutional Ticking industry for over 40 years! 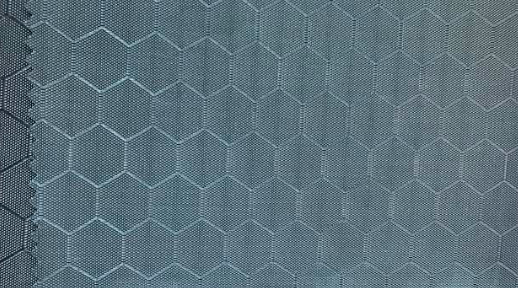 With an innovative, hexagonal design woven in, HEXcel uses a unique blend of high-grade Nylon 6.6, minimizing impact and abrasion resistance, moisture wicking, and stain resistance. HEXcel leads the industry in tear strength, with 40% greater strength than nylon. When combined with an advanced naturally fire resistant thermosetting polyurethane polymer that shields against mold, mildew, and abrasive cleaning agents; HEXcel provides easy to care for Kevlar-like mattress protection and long lasting performance. Also available with a chemical free inherent laminated fire barrier to ensure compliance with 16 RFR1633 and Cal T.B.129. XP Plus is a 210 Denier Nylon Oxford/Urethane coated premier fabric for Residence Hall applications. It is flame retardant, bacterial/fungal and fluid resistant, non allergenic, stain and tear resistant, economically efficient, and comfortable for college students. Also available with a chemical free inherent laminated fire barrier to ensure compliance with 16 RFR 1633 and Cal T.B.129. Polyurethane Coated Four Way Stretch, Chemcare BFR is flame retardant, anti-microbial, fluid resistant and highly durable, as well as highly weldable for sealed seam mattresses.